Welcome! We are a traditional Martial Arts school with modern self-defense techniques and one of only a few schools that teaches ninjutsu. In fact, we are the ONLY school in all of Kentucky that teaches under the guidance of Black Belt Hall of Fame Member Stephen K. Hayes! So what exactly is it? And how in the world did ninjas end up in Hopkinsville, Kentucky? Making lots of new friends, staying physically fit and having a strong body, mind and spirit are just a few of the reasons to join Elements of Self Defense. That may seem a little scary at first, especially if you’re new to martial arts, but don’t worry because we’ll make sure you have a buddy every step of the way. You’ll actually make a lot of NEW FRIENDS here. And they’re all very much like you – very helpful and ready to give you a high five whenever you accomplish something big or small. Elements of Self Defense is not only FAMILY FRIENDLY, it’s also impeccably CLEAN and SAFE. Your safety is first and foremost here. So is focusing on your fitness goals. But the BEST part about class is that you’ll have more FUN than you can stand! You’ll talk about it all the time and you won’t be able to wait for the next class! Check out our SUPER LOW web special going on right now, but only for a limited time! Our classes fill up fast because it’s such a great deal, so reserve your spot today! Develop a Strong Mind. Our awesome instructors teach your kids how to become more focused and disciplined. Martial Arts are about self-control – both on and off the mat. Having those good qualities at a young age will prepare you to meet and overcome real life challenges. Martial Arts is a great way to deal with the STRESS of daily life…and even kids have their own kind of stress. I’m sure you know all about that. Kicking, punching, grappling and throws all help to fight the harmful effects of stress and keep you in GREAT SHAPE. It also helps improve balance and coordination. All good stuff! But Can I Really Do This? Yes, You Absolutely Can! Everybody wonders about that or they ask if some kind of experience is necessary to join our Martial Arts school. The short answer is no experience of any kind is required to start taking lessons and improving your overall health and fitness, whether 4 or 84. The only thing you need to get started is to have some curiosity, an open mind and the desire to learn. So come join our martial arts family and let’s do this together! You’ll see after only one class how our school offers everyone the opportunity to be themselves, learn quickly and excel at a much faster pace than any other school around. You will walk out of your first class having learned a technique that you can immediately use to defend yourself. To-Shin Do is a modern form of Ninjutsu and the literal Japanese to English translation of To-Shin Do is “Sword Spirit Path”. Practitioners of the art use a more developed translation in which: To = sword, Shin = the focused spirit of intention, and Do = the path to mastery. We can’t wait to empower you and see how fast you excel and become a winner with us! 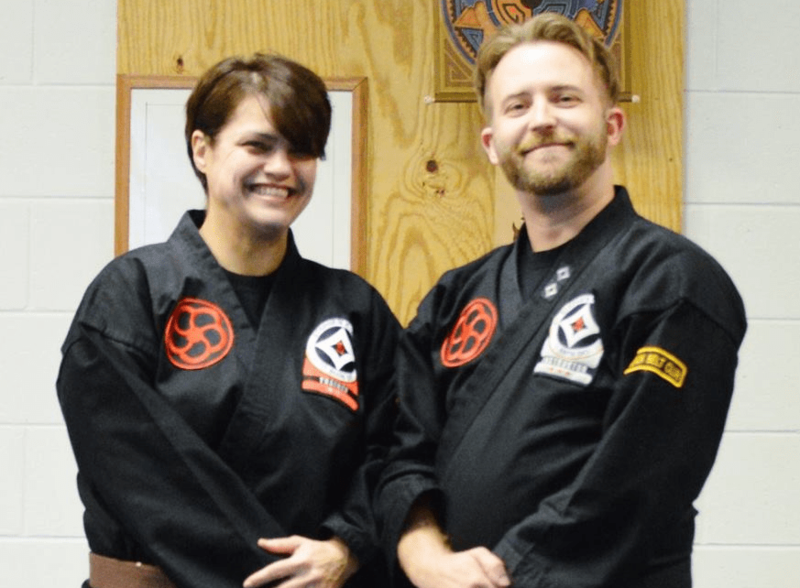 Dustin Huber is our Senior Instructor and currently holds the rank of Shodan Black Belt in To-Shin Do and a 1st Degree Black Belt in Choong Sil Kwan Taekwondo. He has been teaching for 10 years. Billie Lopez is our Kid Ninja Instructor and currently hods the rank of Shodan Black Belt in To-Shin Do. She has been teaching for 5 years.